In the alternative playground that is Brighton I am always surprisingly stumped for a place to go for a good, honest cup of cha that is not some Godforsaken chain (spit). When a good friend of mine surprised me with a lunchtime visit to Brighton, I micro-panicked as the Mock Turtle tea room was a bit of a walk, so stumbling across the tucked away Bar Du Chocolat was a bit of a lucky find. It comes from the people who bring you the cake and chocolate emporium, Choccywoccydoodah (WARNING: totally bone website design). For those of you who don't know, Choccywoccydoodah is a feast for the eyes. Amazing chocolate sculptures that defy gravity and sanity are on display in their main shop window and are definitely worth a peek. I mean, I think I saw Jesus chocolate this year. 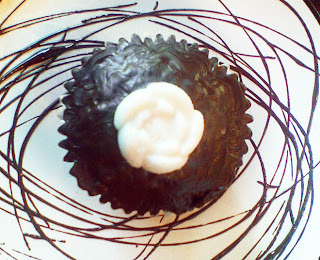 I had a chocolate & coconut cupcake topped with a sugar rose and practically a jug of hot chocolate to wash it down with. Apologies for the bad photo but I only had my phone, but you can see how pretty they are and the cakes looked fantastic. Bar Du Chocolat is more of a boutique than a café with red chaises lounge, voluptuous, nudy murals and rhinestones a plenty. It's real tongue in cheek decadence which matches their style of cakes a treat, making it a very fun place to pop in for a cuppa and as Brighton as it gets. Choccywoccydoodah are famous for their wedding cakes and I have been to two receptions now where they have made a real visual impact (and no doubt an impact on the father of the bride's wallet) but have had little impact on taste. In fact, one wedding the cake was left uneaten at the tables - can you imagine the horror? The cakes have been dry and well, very ordinary. My cupcake was ok but much the same as the aforementioned wedding cakes but the hot chocolate was good. Despite that, it's well worth a trip for a cake and drink for the decor alone and then a jaunt to the main shop in Duke Street for the visual feast.